Hope someone can help me identify please and how old it could be please? Comments for What is this please? I stumbled across another one yesterday at a different beach. My little 4 year is treasuring that one :) Once youve got the eye for seaglass, your off! re: what is this please? 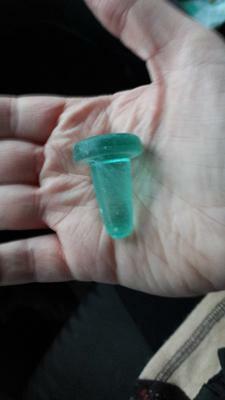 This is a bottle stopper, probably for a medicine bottle. Very nice piece! Wow! That is a bottle stopper. It is almost impossible to tell the date and from what kind of a bottle. But you have an exciting and very hard to find treasure there.